Shop our huge selection of economy velvet bracelet & watch displays and showcase your pieces in style! 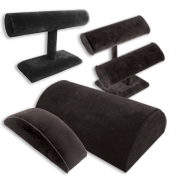 Discover the best black velvet watch stands, bangle displays, tray inserts, vertical & T-bar bracelets stands & elegant pillows for your collections. Get the best prices thanks to our wholesale deals and freshen up your store's look!